On June 12, 2018, State Councilor and Foreign Minister Wang Yi met in Beijing with Secretary-General Dato Lim Jock Hoi of the Association of Southeast Asian Nations (ASEAN). Wang Yi expressed that this year is of important significance in inheriting the past and ushering the future as it marks the 15th anniversary of the establishment of China-ASEAN strategic partnership. As a major country outside the region, China was the first to enter into the Treaty of Amity and Cooperation in Southeast Asia, the first to establish strategic partnership with the ASEAN, and the first to sign a free trade agreement with the ASEAN, leading other major countries to pay more attention to and speed up the development of relations with the ASEAN. These important achievements are attributed to the political guidance of the leaders, as well as the results of the joint efforts made by people of the eleven countries. Wang Yi said that both sides agreed and confirmed to join hands in building an even closer community of shared future on the basis of the achievements from cooperation in the past 15 years. The first is to formulate the China-ASEAN Strategic Partnership Vision 2030, making medium- and long-term plans for bilateral cooperation in the future. The second is to well hold the China-ASEAN Year of Innovation, providing new and strong impetus for China-ASEAN relations and respective development of China and the ASEAN countries. 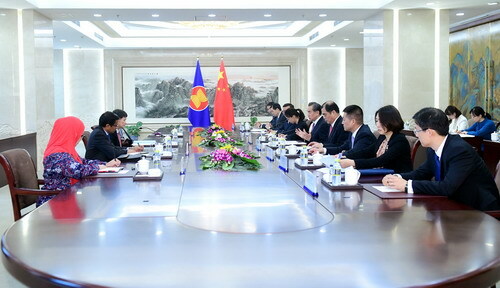 The third is to enhance the alignment of the Belt and Road initiative with the Master Plan on ASEAN Connectivity 2025 and other development plans of the ASEAN, opening up new fields and new prospects for bilateral cooperation. We will take the 15th anniversary of the establishment of China-ASEAN strategic partnership as an opportunity to advance a series of new cooperation measures. Dato Lim Jock Hoi expressed that China is the most vigorous strategic partner of the ASEAN, and thanked China for supporting and participating in ASEAN sub-regional cooperation. The ASEAN Secretariat stands ready to play an active role in deepening ASEAN-China cooperation in politics, economy, trade, social and people-to-people and cultural engagement and other fields, so as to provide enduring impetus for bilateral cooperation and friendly relations as well as make new contributions to regional peace and prosperity. Both sides also exchanged views on the South China Sea issue. 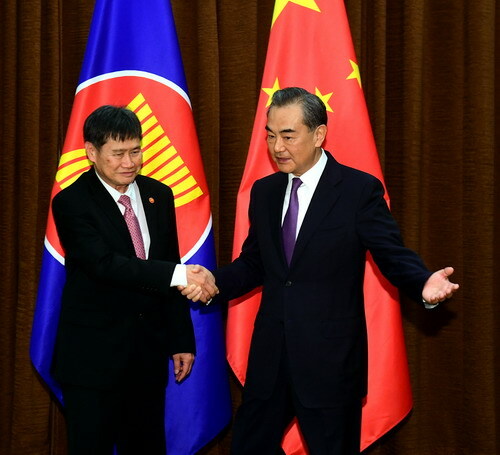 The two sides both agreed that the situation in the South China Sea has been obviously stabilizing due to the efforts made by China and the ASEAN countries. 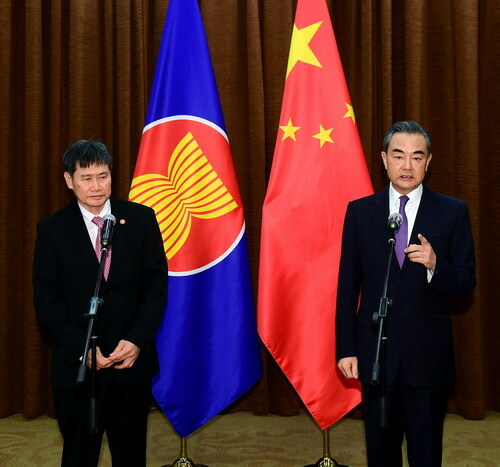 China and the ASEAN countries will speed up the consultations on the Code of Conduct in the South China Sea (COC) on the basis of comprehensive and effective implementation of the Declaration on the Conduct of Parties in the South China Sea. It is believed that the new round of senior officials’ meetings to be held in China at the end of this month will achieve new progress. 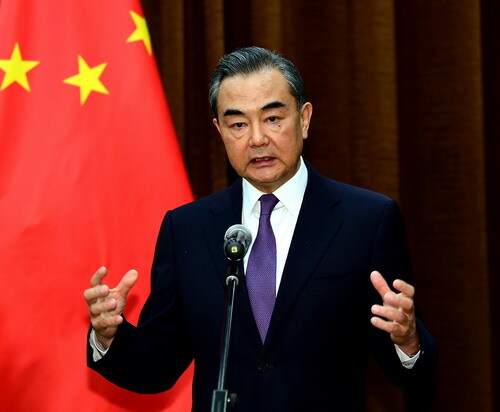 Wang Yi stressed that as long as countries outside the region do not stir up troubles, the South China Sea will maintain stability, and the consultations on the COC will be advanced smoothly.